If you come to Egypt to get a taste of history rather than just a place to relax by the sea in the sun, well, you don't want to miss going to Luxor. 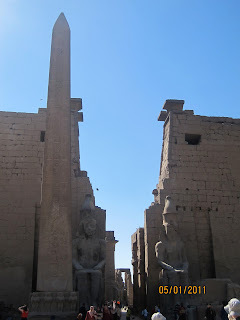 The good news is that it doesn't take much time to see the main sites of Luxor. You can very easily see them in 3 days. Getting to Luxor is easy. Flights to Luxor run about $100 and trust me, you will appreciate spending the extra cash to fly rather than spending the night on an overnight train to Luxor. The best places to stay in Luxor are on the East Bank. There are hotels on the West Bank as well but you will have to take a ferry across the Nile to get to most of the restaurants. If you have small children I recommend taking an extra day in Luxor. It is easy to do East Bank Luxor one day and West Bank Luxor another and finish it all at one time. However, it is quite exhausting to do so. We used a modified schedule from the above when we went to Luxor recently. Keep in mind that I have a one-year-old that needed to go back to the hotel every day for a nap (and I think the rest of us much appreciated this down time as well). What advice do I have for someone visiting Luxor? Buy books about Luxor before arriving in Luxor. I recommend the Illustrated Guide to Luxor and the Lonely Planet Egypt guide. Carry them with you to help guide you through the sights. Stay close to the center of town. If you plan to spend a week in Luxor, by all means, stay out at a nice resort and enjoy the heated pool in the sunny Luxor afternoons. Otherwise you'll hate have to hop in a taxi every time you need to get anywhere. Don't buy souvenirs in Luxor. If you're going back to Cairo, wait to buy any souvenirs from the Khan El-Khalili. The stuff you'll find on the streets of Luxor is much cheaper at the Khan. Don't forget that a taxi on the West Bank of Luxor can take you home to the East Bank (there's a bridge down the Nile). So if you're really exhausted after a long afternoon in the hot sun, ask the driver how much he'll charge to take you all the way back to your hotel. If it's reasonable, enjoy the air-conditioned ride back. Check the Sound & Light website for times & days for the Karnak Temple shows. Shows are offered in different languages at different times. You'll want to plan your schedule around that. Buy your tickets to the Sound & Light show early. You don't want to get stuck without a ticket when all those tour groups have snagged all the tickets for that day. Choose wisely which tombs you'll enter in the Valley of the Kings. Remember that you can only enter 3 tombs on one ticket. Tutankhamen and Rameses VI are separate tickets (but well worth the money). Watch out because a lot of tombs are closed at certain times when least expected. Recommended tombs to visit are: Thutmes III (Tutmosis), Amenhetep II (Amenotep), Merneptah, Tausert & Seknakht. Try to start at the top of the Valley and work down (read: most difficult ones first). Carry a bottle of water with you. Places like the Temple of Hatshepsut and the Valley of the Kings are hot and don't provide much relief from the sun & heat (those tombs aren't any cooler) so you will need to have a water bottle handy. Take the time to visit the Luxor Museum. I know it seems crazy to waste time in a museum when there are sights to see, but I've found that visiting the museum before seeing the sites kind of helps put a face to the pharaohs (after a while they all kind of run together). What about you? Do you have any advice for visiting Luxor?